I had the pleasure of meeting a gorgeous, bright, and oh-so-tiny little one this weekend. 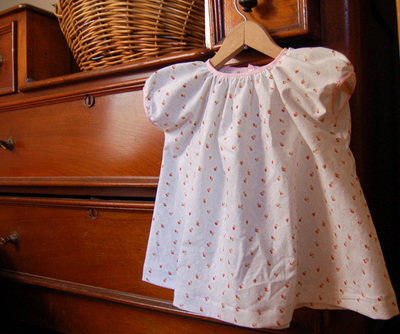 This little summer dress was for her - for Miss Pheobe. It was my token bribe to hold and kiss her for a minute. Oh, it was heavenly - I could have just looked at her all day long, near tears from the amazingness of her two week old being. Gosh, can you imagine what kind of a grandmother I have the potential to be? Over-the-top and ridiculous, that's what. The dress was based loosely on a vintage dress of Adelaide's, or mine rather, as since it no longer fits her, I've reclaimed it. Am I really that person who has baby dresses on my wall as decoration? Why yes, yes I am. And they're mostly pink too. 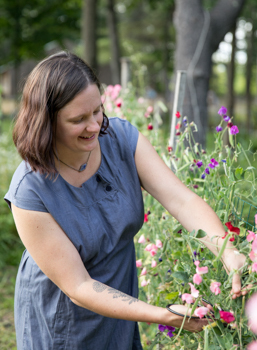 Sometimes I'd like to go back and tell my 22 year old Women's Studies degree -carrying, shaved head, pierced-everything self just what it is that I spend my days doing now, and that my sewing room walls are decorated with pink baby dresses. I wonder what she'd think. I'd like to think she'd think it was rad and as feminist as she. Because I certainly think it is. Back to the babies. 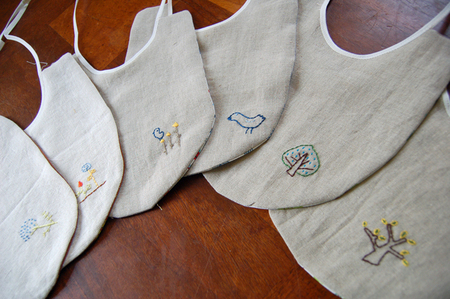 These linen, embroidered bibs have become a favorite little project of late. 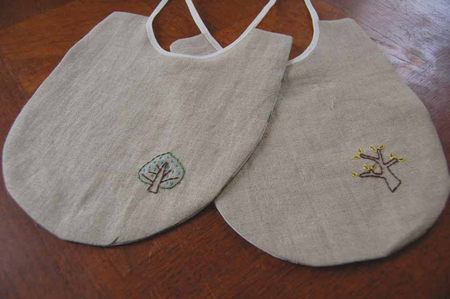 They're easy to carry with me, coming up with the embroidery designs is such fun, and, of course, they're such a reminder of the oh-so-little days of my babes, which seem to be disappearing so fast, as I realize each time I see a very new one like Pheobe. I've put a few of these sets in the shop today. You can find them there, if you're interested!